Posted on December 13, 2016 by Maddy Hopson / This entry was posted in Product Reviews. Bookmark the permalink. Branded as the “dynamic convection vaporizer” the Firefly 2 oozes luxury. The newer model is noticeably different from the original Firefly, even down to the package design. Upon unwrapping the pristine, white box you are greeted with a sleek and simple vaporizer with the words “enjoy your flight” printed just below the mouthpiece. If you couldn’t already tell, you’re in for one hell of a journey with this device. The careful and well-versed reviewers here at Sunflower Glass Company couldn’t help but notice how similar the new packaging and design are to the Pax brand. And we’re all for it- we’re enamored with this beautiful piece of technology. The magnetic lid style from the original Firefly made a comeback in this redesign, with an added bonus of a reflective interior that doubles as a mirror if needed. The shape of this product has changed drastically since its big brother hit the market. 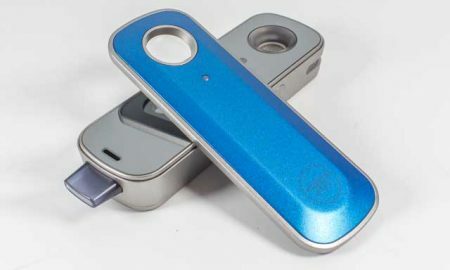 The Firefly 2 is rectangular in shape and is 5 inches in length (mouthpiece included), 1.5 inches in width, and about an inch thick, making for a sturdy device that’s still portable enough to carried in a purse or bag. Compared to its predecessor, this vaporizer is smaller, lighter, and more modern in appearance. At the top of the device there is a clear window into its oven chamber that is far from discreet but gives the user a unique glimpse into the heating process. Below that is a small LED light, and near the bottom of the product is the company’s iconic logo, an encircled small firefly. The plastic mouthpiece is short and simple. Created by a former Apple designer, the Firefly 2 is so easy to use that even the most inexperienced vaporizer user can feel comfortable operating the product with ease. Once that magnetic lid is removed, simply pack your herb into the glass chamber and press both touch sensors on the sides of the Firefly 2. The LED light will blink and then become solid green when the vape is ready to be used. Dry herb can be heated at five different temperatures which beats out most other vapes on the market. To use just keep your fingers on the sensors and inhale. A new feature of this updated Firefly is its ability to heat concentrates as well as dry herb. Again, simplicity prevails to make the experience easy and rewarding for any user. The vape comes with concentrate pads that can be placed in the glass chamber and heated up for an additional 15 seconds before use. From there it’s as easy as inhaling! Cleaning is very simple with this product which is not always the case with concentrate vaporizers. The cleaning kit includes wipes, picks (to remove concentrate pads) and a brush to keep that glass chamber clean as a whistle. The dynamic convection style means that the vape operates solely on super-heated air which makes the design aerodynamic and easy to keep maintain. Some users go weeks without cleaning their vape and have no problems getting the same high quality hits but we definitely recommend giving your Firefly 2 some TLC fairly frequently. This new stud has also improved upon the flaws of its predecessor in the battery category. The Firefly 2 comes with two batteries, something that not many herbal vaporizers of this quality provide. The battery life has improved to last two times longer than the original Firefly. Each battery charges fully in under an hour on a charging dock eerily similar to the Pax. 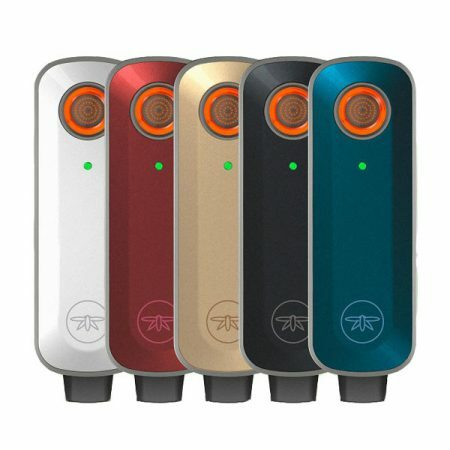 The final unique feature of this gorgeous vape is a downloadable app that allows you to control temperature and put the Firefly in concentrate mode if desired. The Firefly 2 has covered all the bases and set the bar high for the future of crossover vaporizers. Dubbed the “iPhone of Vaporizes” by Newsweek the Firefly 2 certainly lives up to the hype. Its performance is outstanding and the new design seems to be flawless. You will soar with this vape, so enjoy the flight!